What Is Periscope and How Do You Use It? Periscope is a live video streaming mobile app. Anyone can sign up for a free account and start watching live or recent broadcasts. They can also start their own broadcast and have viewers tune into to watch them. Periscope is its own social network in a sense. Just like any other social network you might use, you can create a profile, find and follow users, be followed by users and view content in your home feed from users that you follow. 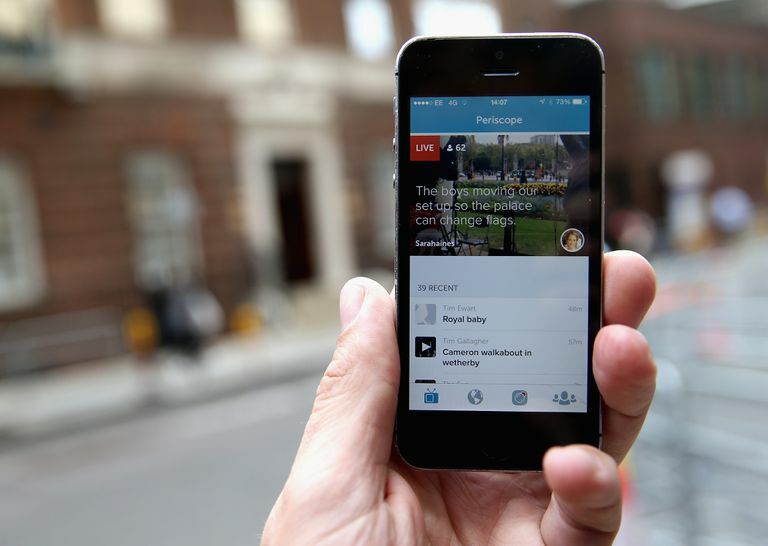 All content shared on Periscope is in the form of broadcasted video. Videos will be marked as "live" or "recent" depending on whether they're happening in real-time or were recently recorded. When you tune into a broadcast as a viewer, you can also interact with the broadcaster by leaving comments or liking it with a super heart. Many other major social networks also have their own live video streaming features built right into them. You might be interested in learning more about Facebook Live, YouTube Live and Instagram Live Video. Home (marked by the TV icon): All the broadcasts from the users you follow will appear here. Search/Discover (marked by the world icon): Get recommendations for broadcasts based on category, see what's trending or browse broadcasts by location. Record (marked by the camera icon): Launch your own broadcast. Notifications (marked by the bell icon): See how other users are interacting with you and your broadcasts. People (marked by the people icon): Get recommendations for users to follow and access your own user settings. Live video broadcasts are great ways to engage with people in real-time. All you need is a camera-equipped mobile device and an internet connection to start watching or broadcasting your own video on Periscope. If you're a viewer, you can catch a glimpse of someone's life or event they're witnessing, wherever they might be in the world. And if you're a broadcaster, you can show others what you're doing or seeing in the current moment. Tap Create New Account (or Log In if you have an account already) to create an account via Twitter, Facebook, Google or phone number. Once you've created your account, you'll be taken to a basic profile page. Tap your profile picture to select an image from your device and enter your Full Name and Username in the given fields. Tap Create Account when you're done. Optionally follow the official Periscope account. You can tap the checkmark beside it to deselect it if you want. Then tap Follow X People (or Skip if you prefer). Tap Enable Notifications or Skip in the top right if you don't want to turn on notifications for Periscope. The following instructions are for the iOS app for Periscope, but can also be used for Android with a few slight variations. Navigate to the discover tab, marked by the world icon in the bottom (iOS) or top (Android) menu. Scroll down to see different categories and swipe left or right to see different broadcasts in each category. Tap any live broadcast to tune in immediately. Tap the Map option at the top to instead see current live trending broadcasts on a world map. Use your fingers to pinch and drag outward across your screen to zoom in. Live broadcasts will show up as numbered red circles while recent broadcasts will show up in blue. Tap any circle to see a a summary list of broadcasts in that specific area, and then tap any broadcast to watch it. Say something: Type a comment into this field for the broadcaster and viewers to read. Tap the heart button: Give it a like. Tap the share button: Share this broadcast on social networks. Tap the three dots: See additional details, such as the username of the broadcaster and a follow button to follow them. See the viewer count live likes coming in: See the viewer count go up and down as more viewers come or leave, plus incoming likes as represented by the floating heart animations. Tap the X in the top right corner: Leave the broadcast. To find more broadcasts to watch, performa a search for a keyword, phrase or user by tapping the magnifying glass icon in the top left corner of the discover (world) tab. Then tap any suggested broadcast category in the list below or swipe between Broadcasts, Places and People to see filtered suggestions. Follow users to see their broadcasts show up in your home feed (marked by the TV icon in the bottom menu). You can do this by tuning into any broadcast and tapping the three dots to reveal the Follow button, or by tapping the Follow button on any user suggested to you throughout the app—such as in search results or in the trending section on the people tab. Consider integrating your social networking accounts with Periscope to connect with friends who are also using the app. Do this by navigating to your home feed (marked by the TV icon in the menu) or the people tab (marked by the people icon) and tapping Connect to Facebook or Connect to Twitter. Navigate to the broadcast tab, marked by the camera icon in the bottom (iOS) or top (Android) menu. If this is your first broadcast, you will have to allow Periscope to use your device's features. Tap Enable Camera, Enable Microphone and Enable Location followed by OK for each to give Periscope permission to use them. If you decide to enable your location, you can always choose to hide your location before your broadcast by tapping the arrow button above the red Go LIVE button so that it turns grey. Decide whether you want to share your broadcast with everybody or just a group of users. If you want to share just with a group, tap Public at the top followed by Create New Group to select the users you want to add to your group. Select the group and tap Done in the top right corner when're finished. Type an optional description on the topic of your broadcast in the field that asks, What are you seeing now? Arrow button: Turn location sharing off or on. Microphone button: Enable audio broadcast only. Speech bubble button: Allow only users you follow the option to chat during the broadcast. Twitter button: Connect your Periscope account to Twitter and allow your Twitter followers to know when you launch broadcasts. Heart button: Turn super hearts off or on. Happy faces button: Allow guest users to participate in your broadcasts. Tap the red Go LIVE button. Double tap the screen to flip your camera. If you want to quickly switch to an audio only broadcast, swipe down on the screen and tap the microphone icon at the top. Watch as users join, which you can see from the usernames that appear in the bottom left. The total viewer count appears in the bottom right. You might also see chat comments and super hearts if you have them enabled. When you're ready to end your broadcast, tap the X in the top right corner followed by the red Stop Broadcast button. When you end your broadcast, it will show as a recent broadcast in users feeds who follow you. They'll be able to view it any time they want, but you can choose to delete it immediately or have it auto-delete after a 24-hour period (explained in steps 10 and 11 below). You can leave an optional star rating for your broadcast experience or choose to skip it. Tap Edit Broadcast to set features like the thumbnail for users who choose to view it as a recent broadcast, tap View Stats to see a graph of your viewers and other figures or tap Moderator Actions if you assigned other users as mods to keep the broadcast under control. Tap the X in the top right when you're done. You'll see a thumbnail listing of your recent broadcast on your home feed. If you want to delete this, simply swipe left on it and tap the red Delete button. If you want your recent broadcast to auto-delete after 24 hours, go to your profile by tapping the people icon in the lower menu, followed by the profile icon in the top right. From there, scroll down and tap Settings, then tap the Auto-Delete After 24hr button so it turns green.